For the past couple of years, I have heard a lot about escape rooms and breakout activities. I love the concept of students working together to solve puzzles and figuring out the codes to open the locks. But I was not sure how well they would work for my students. I only have about 20 minutes of teaching time with my classes and a true breakout would take much longer. And the breakout kits were out of my budget. So when I heard about digital breakouts I became very excited. This was an activity I could do! I could make the challenges simple enough so my students could complete them in one class period. And I knew the kids would LOVE them. 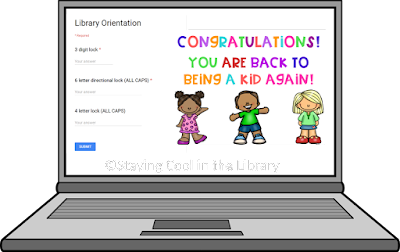 So this summer I made it a goal of mine to create my first digital breakout, and I did: Library Rules and Orientation. 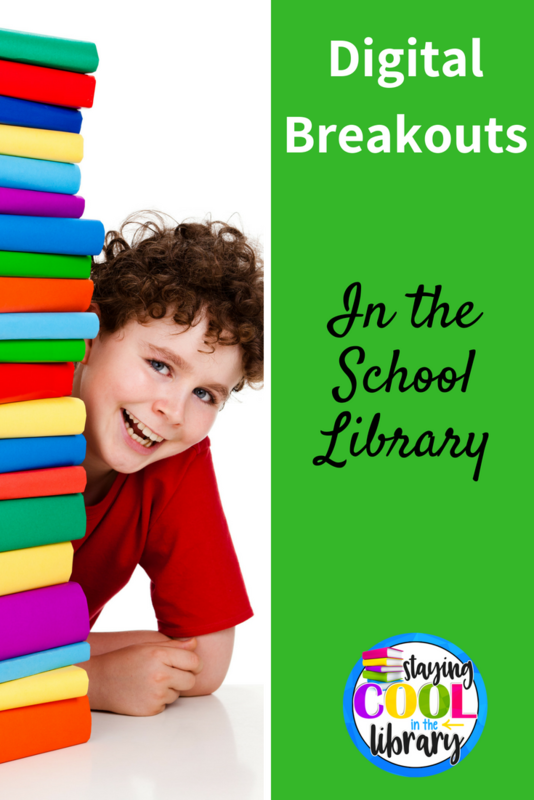 Digital breakouts are the perfect activity to use in the library. It teaches students vital critical thinking skills and incorporates technology and digital literacy skills as well. And students love doing them. 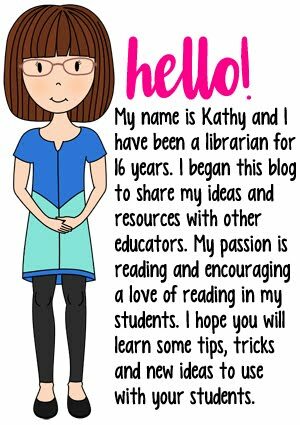 In my experience, it can be a challenge sometimes to keep and hold students' attention when they come to the library, especially 4th and 5th graders. But that is not the case with these types of activities. The students will want to come to the library and will not want to stop working. They will be engaged and working together as a team to solve problems. I definitely recommend students working together in teams of 3-4 if possible. In my library students sit at tables of 4 so this works perfectly for me. And also this is a way for me to control which students work together because all my classes have a seating chart. Students should be familiar with using the devices (Chromebooks, laptops, tablets). And they should be familiar with Google Classroom or at least Google Slides. This doesn't mean they have to be proficient, but they should at least know the basics. If they do not, I would take a class period to go over this. This way when you start a breakout you will not spend a lot of time going over how to open the slide and how to insert a line. This is very important when you have limited time with classes. I will admit that creating my first digital breakout was a challenge. I wanted to make sure that the puzzles were easy enough to be completed in a limited amount of time but still challenging. And I had to decide what types of puzzles to include. In the end, I came up with a breakout with 3 different challenges. I created the breakout in Google Slides and Forms. If you are a Google school and use Google Classroom then you can very quickly share the activity with your students. I provide directions on how to do this if you are not familiar with the process. There are also directions for using it in Microsoft OneDrive. If you are not very familiar with using Google Slides, make sure you take some time to familiarize yourself with the application and learn the basics. At the end of this post, I have 3 different blogs that will help you with this. Before you use a digital breakout with your students you MUST do the activities yourself. Read through the student directions, complete the puzzles and enter the codes into the Google Form. This will allow you to be able to assist your students once they begin the activity. A digital breakout begins with a scenario, a simple story to "set the stage". For the library orientation breakout, the scenario is that someone spilled water on the book "The Wonderful Wizard of Oz". The wicked witch became angry and turned the students into flying monkeys. The only way to break the spell is to complete the puzzles. There is also an alternative version that has cute-looking monsters instead (for any school that is not allowed to have activities with witches in them). The content is exactly the same, just the scenario is different. VERY IMPORTANT: You will have to add a link to the Google Form onto YOUR copy of the breakout. There are directions on how to do this. Before you share this activity with your students you must complete this step. 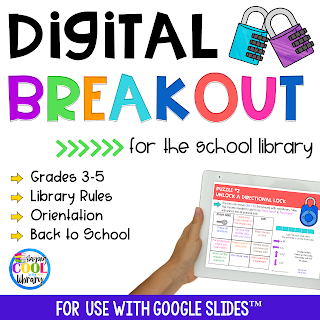 If you don't then there will be no way for students to access the form to enter the lock codes.You will have to do this for every digital breakout that I create. This is a word search with 10 different library vocabulary words. Students will need to use the editing tools and insert a line. They will put the line through the words as they find them. Hidden in the word search are 3 number words. This is the answer to the lock. There are 2 hints to help students figure out the answer. The first hint shows students how many letters are in each word and the second hint lets them know to look for the number words in the word search. Once students figure out the code they will type it into the pink boxes. Any place where students need to type I did insert a text box. If a student deletes the text box a new one can quickly be inserted. This puzzle is a 4 x 4 table. Each box has a library rule in it (as well as a start and end box). Students will go to the start box. 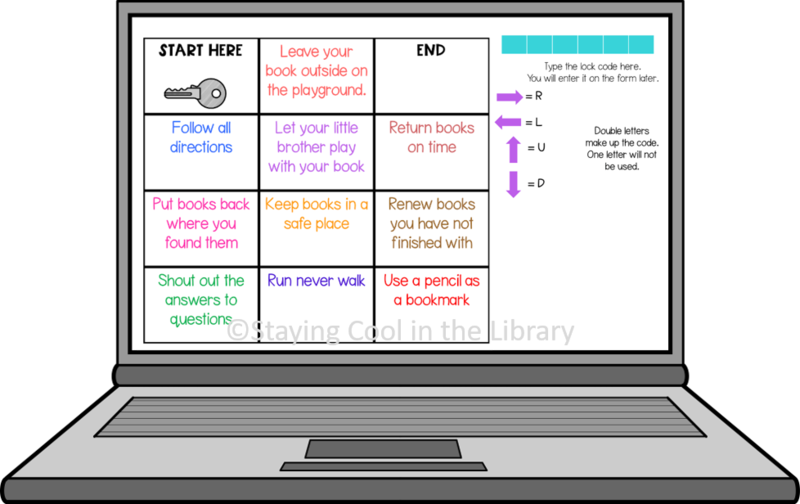 They will "move" the key to the box that has a correct library rule. They will do this until they reach the end box. This is a directional lock so the answer will be either R (right), L (left), U (up) or D (down). The hint says that the lock is made up of doubled letters and one letter is not used. The code is: DDRRUU. Students will type in the answer in the green boxes and go to the next puzzle. The last puzzle is made up of 4 questions. The questions are about types of library books and call numbers. Students will type in the answer to each question. One of the letters in each answer has a circle around it. The letter that goes in the circle is the code. The lock answer is READ. The hint says that this is a librarian's favorite thing to do. 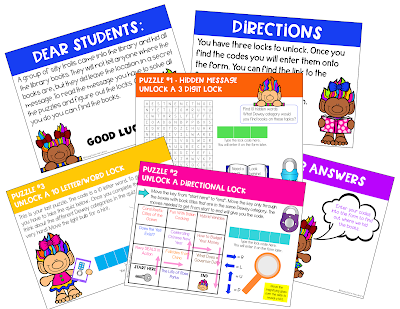 When all 3 puzzles are completed, students will enter the lock codes into the form. In order for the form to be submitted all 3 codes must be entered and they must be correct. Once the form is submitted successfully a confirmation message will come up. In the message, there is a link to an online jigsaw puzzle. The puzzle is just a picture that I created that says the students were successful in completing the breakout. You can delete the link to the puzzle from the form if you do not want students to complete it. 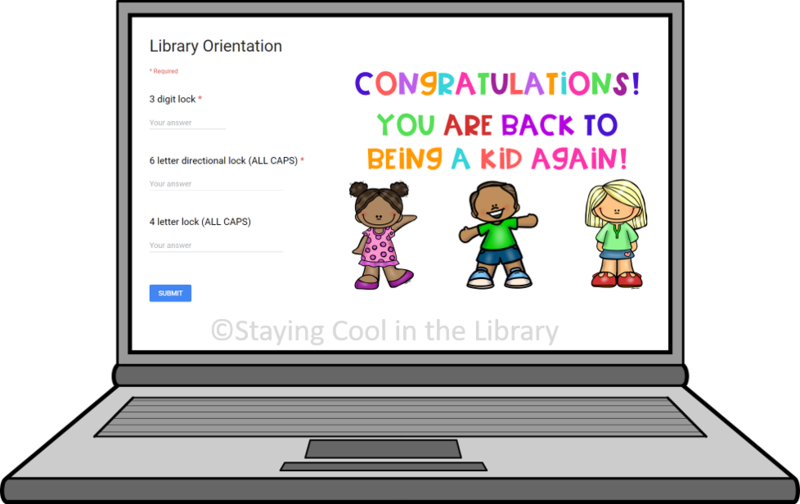 I am still learning how to use Google Classroom in the library with my students as well as how to use each of the individual apps. In my school, there also has not been much training provided so I am having to look up and find information on my own. If you are in a similar situation I thought I would share with you some resources that I have found to be a tremendous help. Teacher Tech with Alice Keeler - This blog has a wealth of information on it. Whatever question you have chances are the answer can be found here. Create, Dream, Explore - This blog has many informative posts on using different Google apps in the classroom. Ditch That Textbook - This blog is similar to Alice Keeler's. There are a lot of lesson ideas and suggestions on how to incorporate Google apps in your lessons. In addition to the library orientation, I also have a Dewey Decimal Review Breakout. The formats are very similar. In the Dewey Decimal Breakout, students will complete a word search, do the directional map activity and take a quiz. In order to complete the breakout though they must also decipher an emoji cipher message. You can purchase both of these breakouts from my TpT store or on my website. What types of breakouts would you like to see? What questions do you have? Please leave a comment or drop me an email and let me know.